Identify the top priority use cases for Chatter in your organization. Put together a launch plan for Chatter. Decide whether to turn on Chatter for all users in your company or do a profile-based rollout of Chatter. Developing a Chatter rollout strategy is critical. Because Chatter functionality is intuitive, it’s likely your user training effort will be minimal. However, if you’re not already using a social collaboration tool, invest time in getting your company ready for a new way to communicate. For many companies, Chatter represents a cultural shift and requires champions at all levels of the organization to make it a success. Crafting and executing a rollout plan is key to adoption. Whatever you do, don’t skip this step. Make your first step identifying people at your company to be Chatter champions. Executive Sponsor: Every company needs at least one executive identified as the sponsor. This person must believe in the power of social collaboration and Chatter. They must be willing to invest time to make Chatter collaboration a success. When your Executive Sponsor is actively posting in Chatter, others follow suit. Now, this person usually has a full calendar, so a good guideline for your Executive Sponsor is “one post a day.” That’s manageable and sets the right example for others to follow. Evangelist: You can’t be everywhere at once, and with Chatter you don’t have to be. Right now, there are people at your company who have incredible knowledge and already love social collaboration. Engage those users! 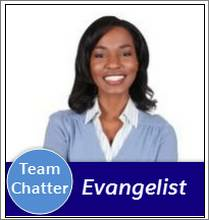 Formally recognize them as Chatter Evangelists, and engage them in helping drive Chatter success. Your evangelists can help answer questions, encourage other users who are nervous about posting, create and manage groups, and curate content. Community Manager: For Chatter to soar you need great content and a sense of community. You need a Community Manager curating quality content and driving user engagement. Examples of great content include helpful files, links to industry news articles or videos, and posts about events or exciting announcements at your company. Your Community Manager drives overall engagement at a strategic level. The manager measures your results, works with evangelists, and deploys adoption programs to keep Chatter going long after rollout. Depending on the size of your company, a single person could fill multiple roles. Making your team publicly known to your company is important; it formally recognizes their status and establishes their role. One idea to promote visibility is to create special profile photos with some kind of social collaboration branding or icon. Create photos for your Executive Sponsor, Community Manager, and Evangelists. This way everyone knows who’s on the Chatter adoption team. Work with your business users to identify the right use cases to address with Chatter. Identifying the best use cases promotes healthy adoption. Bring your stakeholders together at the start of your rollout project to brainstorm which processes could be moved into Chatter. Download the 50 Ways to Become a Social Enterprise eBook, and share it with your stakeholders. Encourage them to gather good use cases for Chatter. Work with each department to come up with a list of use cases where social collaboration could be helpful. Then prioritize those use cases, looking for the ones with high impact and easy implementation. Work with your Executive Sponsor to identify company-wide use cases for Chatter. Here are some sample use cases. An All-Hands Chatter group you can use for company-wide collaboration during quarterly or annual company calls. When your teams are geographically distributed or you have remote employees, an all-hands group is especially important. A Corporate Goal Chatter topic to highlight and share around a key company objective. If your company decides it’s the year for giving back, make it a topic. Encourage your employees to share how they are giving back by marking their Chatter posts with “#givingback”. Topics can promote company-wide collaboration and visibility. A series of quick polls to gauge employee reaction to a planned product enhancement. If you’re looking to get fast feedback while you iterate before you take it to market, consider informal polling in Chatter. Use Chatter polls to collect insights from your employees. Draw attention to your polls by @mentioning groups and users. A Competitive Strategy Chatter group where you can share insights on your competitors, access files and tip sheets, and get quick answers from experts. An Event Planning Chatter group where you can collaborate while planning a department event. Collaborate on the slides for the event, schedule speakers, share details on the agenda. Even invite external vendors who could be supplying food, drinks, or equipment to coordinate all the details. Identifying the right use cases and involving your company’s departments in the planning helps your teams to adopt and get value from Chatter. A great Chatter rollout needs a solid communication plan. Develop a plan to help you advertise and explain Chatter to your users and get them excited about what’s coming. Create Marketing Content: You can send drip emails and videos to advertise that Chatter is coming. Consider allocating budget for fun swag or a launch party with cake and balloons. Making the launch of Chatter an event for your company helps to build excitement and momentum. Chatter is intuitive and usually doesn’t require much in the way of user training. Nonetheless, it’s a best practice to be clear about the rules of engagement, or “Chattiquette.” Chattiquette helps to ensure that your users stay on topic and maximize the value of Chatter. Consider putting together a simple list of guidelines for user behavior. Publish the list and share it with your users. Post it in a public place, like an All Company Chatter group. Encourage your Executive Sponsors and company leaders to set the right example. Ask your Community Manager to identify any users who need guidance. Once you’re live, you can track your results. You can download Chatter Usage dashboards from AppExchange. You can also download the Chatter Challenge dashboards to monitor group and follow activity on Chatter. Your Community Manager can use both of these dashboards to monitor the overall health of your Chatter adoption. Your Community Manager can also conduct surveys, either using Chatter polls or through focus groups, to gauge the response to Chatter and prioritize future work. Now that you have your rollout strategy, you’re ready to dive into Chatter. Salesforce organizations created after June 22, 2010 have Chatter already enabled for all users by default. Nonetheless, you can choose to roll out Chatter to all users at the same time or do a profile-based rollout. We recommend that you roll out Chatter to everyone at the same time. However, if your company is large or you want to restrict access to Chatter, consider a profile-based rollout. A Chatter profile-based rollout is more useful for larger companies because it allows for a controlled, department-by-department rollout. It’s also useful for companies or government agencies with regulatory constraints to give full or no access to Chatter based on employee roles and profiles. With a profile-based rollout, only the users with the required user profile or permission sets have access to Chatter. If there’s no need for a profile-based rollout of Chatter, you’re all set. You contact Salesforce, and ask us to enable a profile-based rollout of Chatter for your organization. You determine which users get access to Chatter. You review and modify existing custom user profiles and permissions sets. For example, verify that permissions in a custom user profile or permission set have the desired setting. You turn on Chatter for your organization.